I am thinking of buying some of the 9/16 true flat Nintendo moulding from America. I am in the UK and the nearest plywood or MDF available is 15mm (5/8). My question is, has anyone done this before and what were the results like? I'd need to buy a lot of the moulding from t moulding com to make it worthwhile and I don't want it to be too small. I could really do with a sample if anyone in the UK has some. I'll gladly pay for a bit to be sure it'll fit right. My fear is that the mm or so difference will be obvious when fitted. My other option is the more readily available 15mm trim I can get which is in fact slightly wider than side panels. I'd then trim it so it looks more like the original trim. HAve you tried contacting the company selling the t-molding that you are going to order from - chances are if you contact them they will send a sample to you that you could use to evaluate. it is not going to fit, Save your money...Laminating your own wood is not a cheap alternative but it is not as hard as it sounds, (*Hint of the day* boat builders do it with fiberglass) (Jennifer prefers the West Systems epoxies because it sets up fast and hard) although it can also be done with water soluble wood glue. Keep one edge square so you have a reference of thickness as you go and work on plastic so you don't scratch it all up before you even start. Thank you for the advice. The company do sell samples but the postage is ridiculously high from USA even for such a little piece. I think I'll email them and ask. They must have had UK buyers with the same question before. Not sure if I'm missing something but I was talking about T slot moulding. Not really concerned with fibreglass etc. Maybe I didn't explain well enough. Thank you anyway. 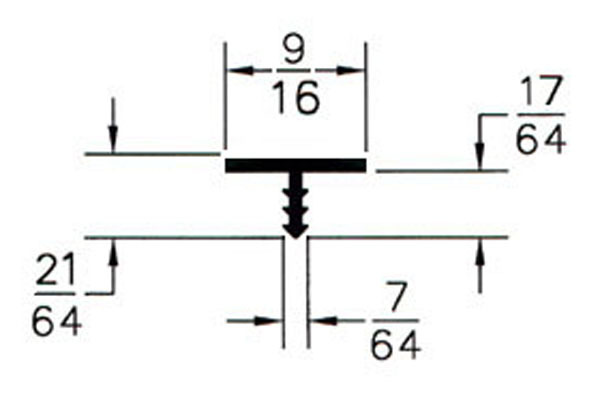 Are you looking at the 9/16" Nintendo flat T-molding from t-molding.com or true flat, true flat for control panel or true offset from Chomping Quarters? You could get pretty close to that using 12mm plywood with a layer of 0.7mm vertical grade laminate on on each side. Thanks Jennifer & PL1. Makes much more sense to me now. It's surprising how little is available in the UK. I can't get the T-moulding or the 3mm carriage bolts for the control panel. Even 15mm MDF or Plywood is hard to get and expensive. I saw a 18mm carcass Donkey Kong build at a show, with cheap T-trim and it just looked so lame.. I want to do better.